These dry-aged Farmison steaks are coated in a rich, caramelised black garlic paste, then quickly seared with fried shallots. Served with sweet potato wedges, salsa verde, and a fresh green salad. 2. Leaving the skin on, cut the sweet potato into thin wedges. Place on a baking tray and drizzle with 1/2 tbsp oil and sprinkle with a pinch of sea salt. Place in the oven for 20-25 mins until turning golden, turning halfway through. 3. In a small bowl, with the back of a spoon, squash the soft black garlic cloves to form a paste and mix with 1 tbsp oil and a pinch of sea salt and black pepper. Rub this mix over the steaks and set aside. 4. Slice the cherry tomatoes in half and dice the shallot. 5. To make the salsa verde; finely chop the coriander and parsley leaves. Roughly chop the capers. Add all these to a small bowl with the red wine vinegar, 1/2 tbsp olive oil, a pinch of sea salt and black pepper. 6. Preheat a frying pan to a medium-high heat with 1/2 tbsp oil. Add the steaks and cook until golden brown, 2-3 mins each side for medium-rare or 4-5 mins each side for well done. Remove from the pan and leave to rest. Meanwhile, add the shallots to the pan on a medium heat and cook for 3-4 mins until softened. 7. 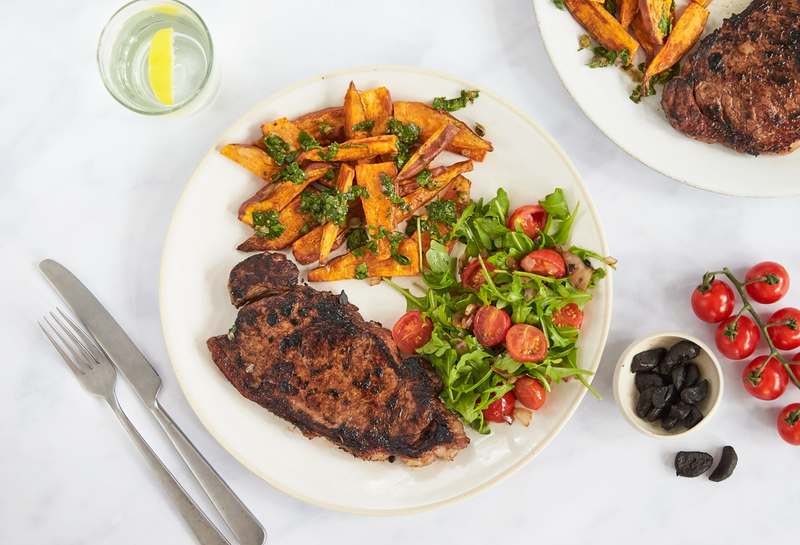 Place the black garlic steaks on two warm plates alongside the sweet potato wedges. Top the wedges with the salsa verde and serve alongside the rocket, topped with the cherry tomatoes and shallot.